Heartfelt Balance Handmade Life: Hang Your Favorite Memories with AdoramaPix ~~ Metal Print Review We LOVE ours! 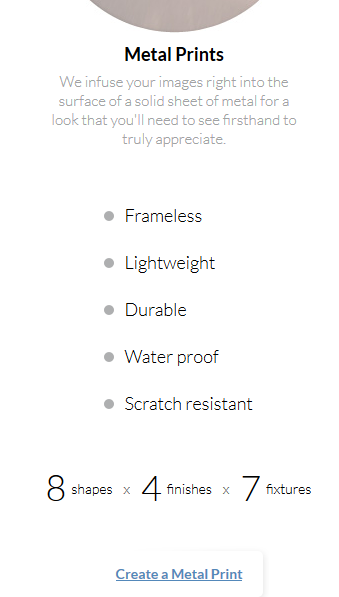 Hang Your Favorite Memories with AdoramaPix ~~ Metal Print Review We LOVE ours! If you're like me, you love having photo memories. . . . . . like, everywhere! On your phone, on your computer, in scrapbooks, in old-fashioned photo albums, on your walls, at your office, in your wallet. . . . . . . It would be an understatement to say that I have "some" photos. I have so many photos, sometimes it's difficult to figure out how I want to display them all. I was recently offered the opportunity to try out a metal photo print from AdoramaPix. I thought it might be cool. I wasn't exactly sure what to expect, but I love having photos around! I chose the 16 x 20 size. 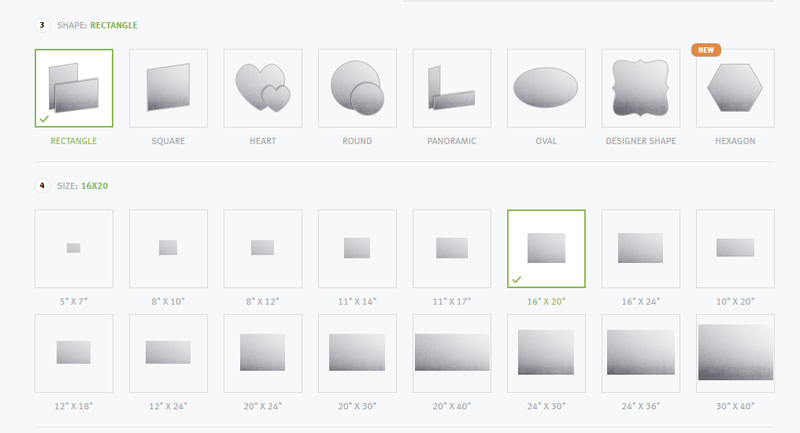 They have several sizes, a couple different shapes and 4 different finishes. This is what the "wall mount" looks like on back. This is the 5 x 7 Metal Print we ordered in the Satin White finish. Both photos came well packaged and safe! This is the 16 x 20 metal print in the Glossy White finish. I love how it looks like you could almost touch the waves! Figure out what type of photo memory you would like (photo book, photo prints, wall decor, cards, calendars,) ~~ for the example we'll do the metal wall prints, since that's what I ordered! You can find them in the "wall decor" tab. In wall decor, you can choose from metal prints, canvas prints or acrylic prints. 5.Choose your shape~~ rectangle, square, heart, round, panoramic, oval, designer shape, or hexagon. 8. It will let you know if your photo is good enough quality for the size you choose. 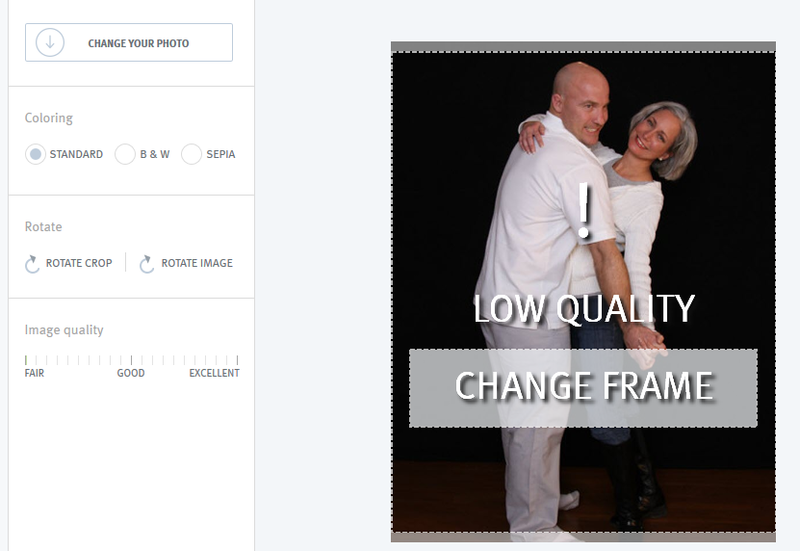 If it's not good enough quality, you might have to go down a size or choose a new photo. That's what happened for us. 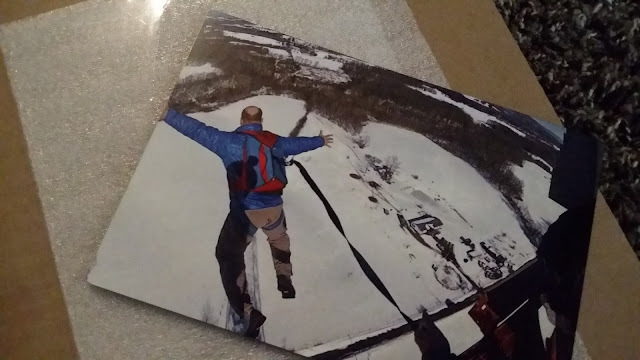 We were trying to use one of my hubby's BASE jumping photos, but it wasn't a good enough photo. I ended up buying a 5 x 7 for my hubby in that one and chose a different one for our 16 x 20. The photo below is just an example of what will pop up if the image quality is low. 9. 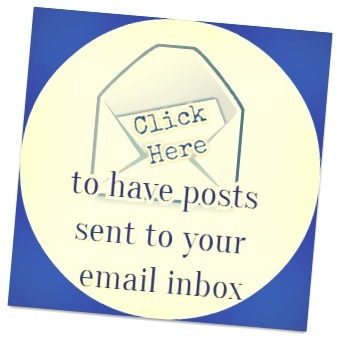 Choose whether you want "No Fixture" or "Wall Mount." We chose wall mount. 10. Choose your finish: Glossy White (our 16 x 20 is Glossy White), White Satin (our 5 x7 is white satin), Glossy Silver, or Silver Satin. 11. When you're finished creating your print, add it to your cart and pay! We received ours very quickly. I was surprised how quick! 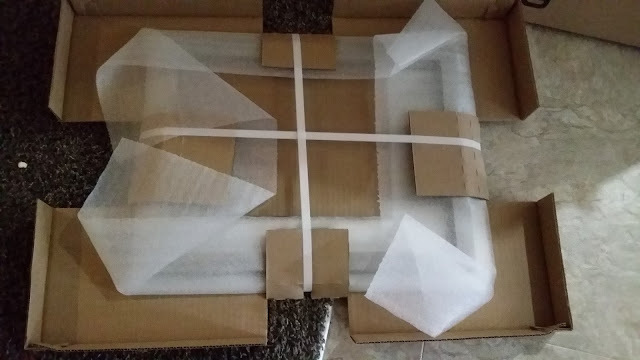 We ordered it at the beginning of the week and received it by Friday. Everyone who has seen our 16 x 20 print has loved it. Here's a caution for you though: Be careful if you've done any touch-ups to your original photo. I forgot that I blended some people out of the ocean in our photo and you can see where I touched up the photo. The quality of the metal prints is amazing though. I am extremely happy with the White Glossy finish, which is supposed to have "bright saturated colors and brilliant whites with a spectacular high gloss finish." I feel like our photo almost looks 3D. The white foam on the waves looks like it's coming off the photo. 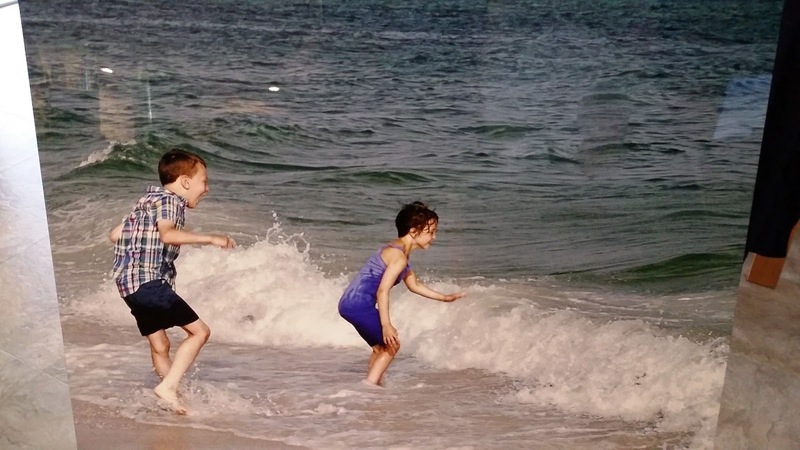 And I love that you can see how much fun my kids are having jumping the waves. There is no way for me to get a photo of my photo print that shows you how awesome this turned out! The price of the 16 x 20 metal print is $74.00 plus shipping. The 5 x 7 we ordered was $20. The shipping on both was $9.95. 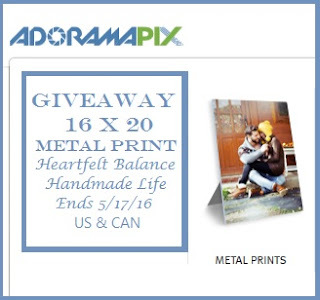 AdoramaPix is letting me give away a metal print in the 16 x 20 size to one of my readers!!! 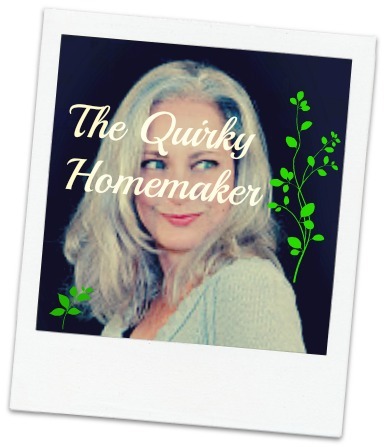 Bonus: They also gave me a coupon code to share with all my readers. metal prints at the AdoramaPix website!!! Winner will win one 16 x 20 Metal Print!!! Must be 18 or over to win. You may enter in the Giveaway Tools Widget below. 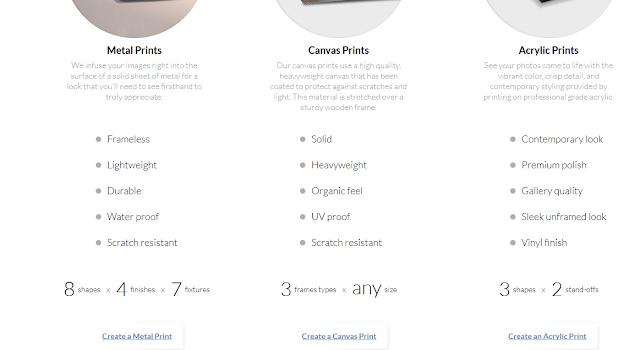 Metal prints, what a unique and classy way to create wall photo art. I'd create one with me, my boyfriend, and his two kids. So we would have a picture of all of us up on the wall. I would use a photo of my grandsons to create a metal print. I would love to use a photo of me crossing the finish line of my first marathon I ran. I would love to create a photo memory from my family's recent trip to Georgia! I would love to get a photo done of my 2 boys when we were camping! I would love to get a new family portrait done at my sisters wedding in june. I have an old photo of my great grandparents from the 1800's that I would like to try to do. My youngest brother died on Christmas eve in a head on collision, so i would love to have a commemorative print done of him. I have a beautiful pic of my two kids on the first day of school - I love it and I think I'd choose this one for the metal print. I would love to create a photo memory of my brother's wedding. I would like to do one of our wedding photos. I would create a metal print of our recent vacation to Yellowstone National Park. I would love a metal print of my dog, Sam! My rainbow is due in July. I would love to create one from the first time my older son meets his new brother or sister. One of our vacation photos to Florida would be amazing! Always want to remember it and I can't think of a better way! I would use one of our engagement shoot photos. I would use a photo with my 5 adult age children in it. 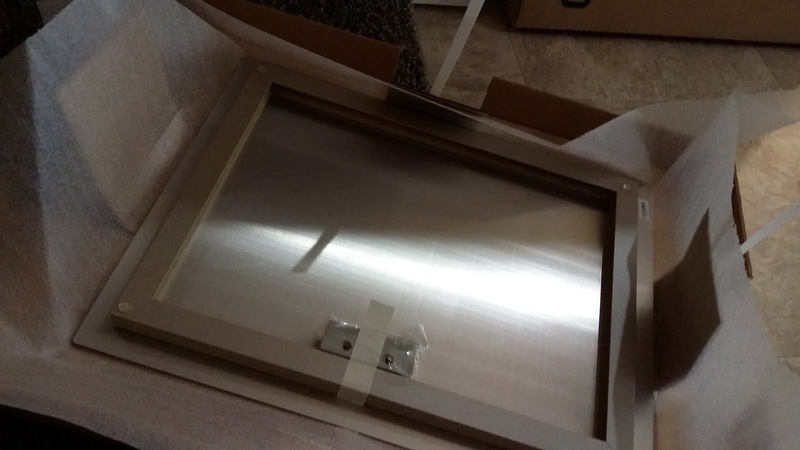 This metal framing looks like a beautiful way to enhance a memory and is neutral enough to go with everything. These metal prints are gorgeous! I'd get one done of our whole family to display. I'd love a metal print of our wedding picture. I have some great shots of my kids that would look great! I have many nature photos that I have taken that would be perfect for this! The last photos with my Mom would be beautiful on metal! I would love to use some flower pics I have taken with my camera! I have some baby photos of my kids that would be great to use! I would use the picture of my kids at the Grand Canyon. I would love to create a metal frame with a picture of my Dad! I have some lovely summer photos that would be perfect! I have some lovely beach photos that I would love to get done as well! it would be awesome to create one of these with a wedding photo. A photo with me and my sisters would be nice I think! I would love to make a print of a picture of my fiancé and I.
I would also love a metal photo print of my kiddos. This would make a lovely gift for the grandparents, I'd use either a photo of the family or maybe just the grandkids! this would be so much fun to use for a family heirloom photo - like of my husbands grandparents. I have a group photo right after my sons heart transplant that would be wonderful to create. A picture of the pups would be nice too.